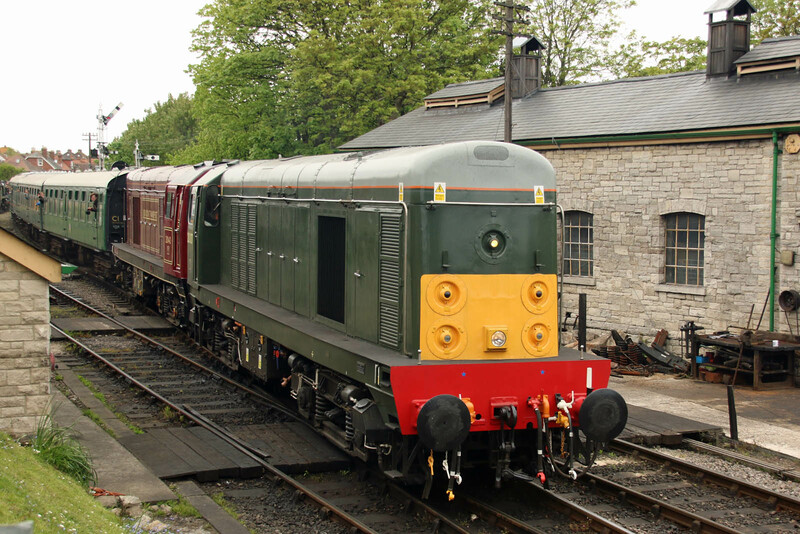 158798 has recently returned to traffic from overhaul, and is now in GWR green, seen at St Denys. 19th May. 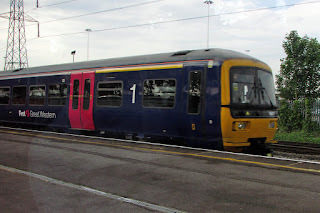 This was formerly charity liveried. 166215 has been added to those with the ride height modification, seen here passing Millbrook on 22nd with 2M97 08:23 Southampton - Great Malvern. 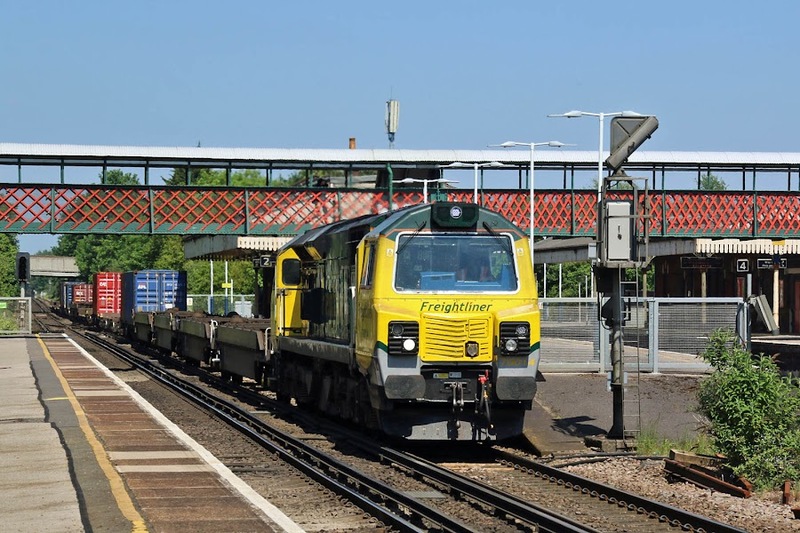 Clearance testing was performed by 166204 from Southampton - Eastleigh - Romsey > Eastleigh - St Denys - Fareham - Southampton on the night of Saturday 5th May. 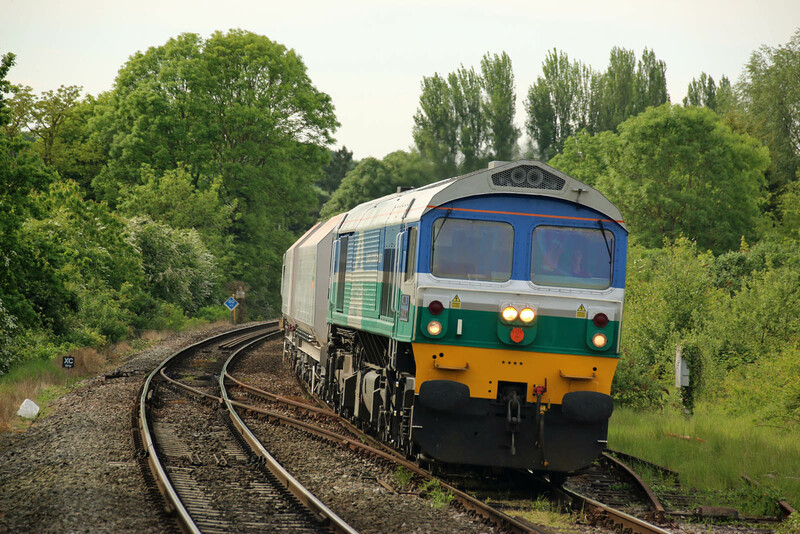 A paperwork issue prevented Eastleigh - Botley - Fareham testing. 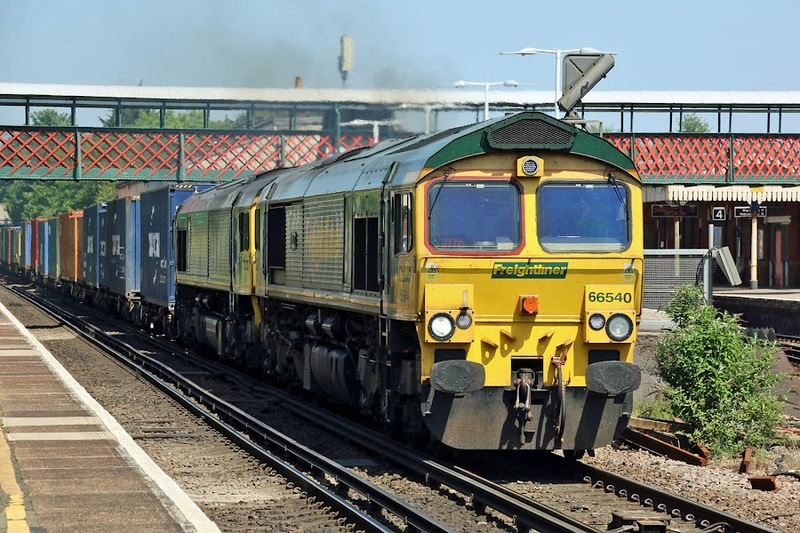 Later, on 24th May, 166212 was checking clearances at Fratton depot: one two. 150926 was poorly by early April, and by early May "150209" was formed for transfer purposes, with the two cars which had been added to create 925 and 926. Moved to Newton Heath on the 20th May. 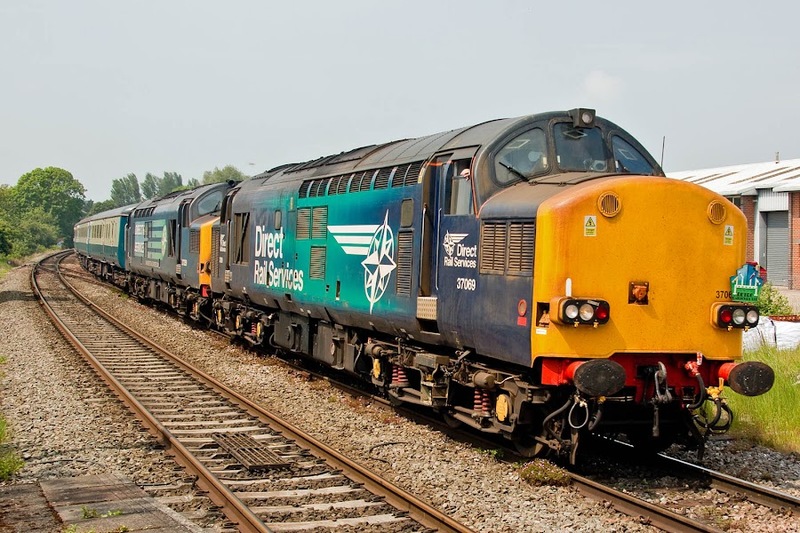 150125 is in Doncaster Works, and 150126 has been seen in the West Country. 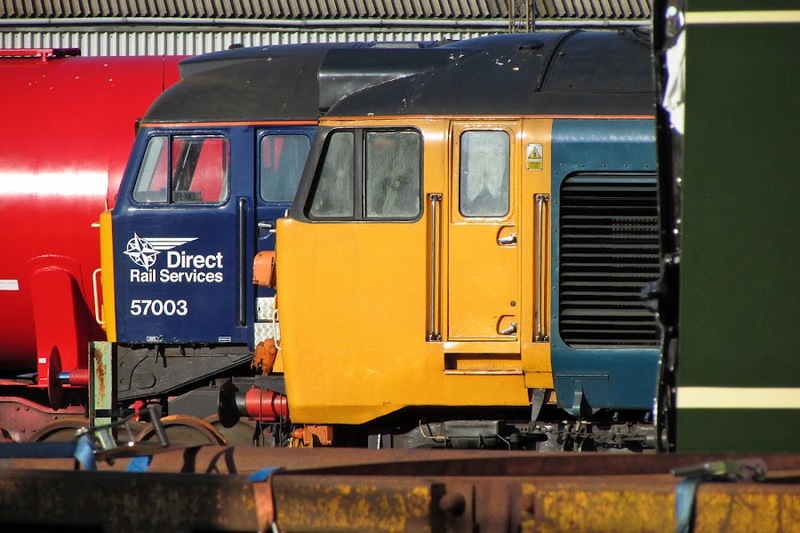 150001 and 150002 seem to be spending time parked up as they are unloved, being reworked prototypes. They do see some work. 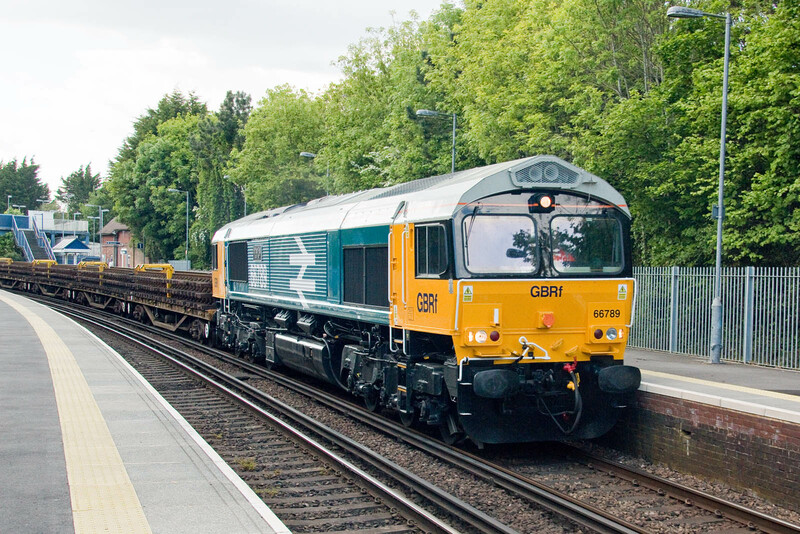 37069 + 37259 5Z53 13:02 Salisbury - Romsey - Eastleigh. with 68025 Superb on the rear. 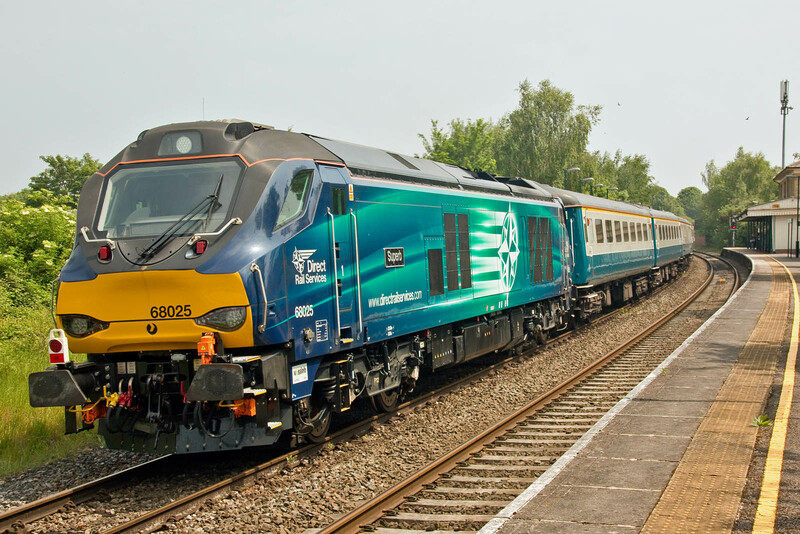 The train left Huddersfield with 57305 providing ETS, but this was failed, and replaced at Crewe by 68025, losing about 30 minutes. 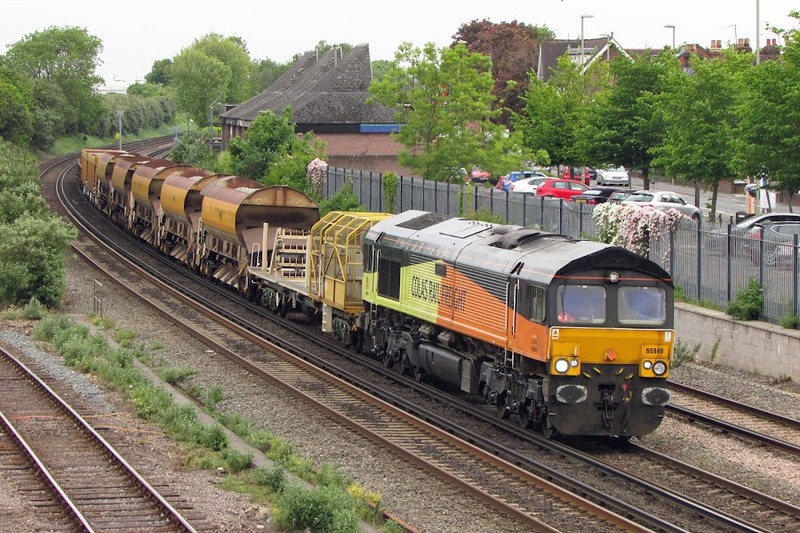 Consequently the ECS was late in arriving at Eastleigh Works, where run-arounds were planned. 37069 (English Electric Robert Stephenson & Hawthorns, July 1962) leads approaching Romsey. 2nd locomotive is 37259 (English Electric Vulcan Foundry, January 1965). Mk 2F TSO M5998 completed at BR Derby in June 1974 to Lot 30860. 68025 Superb has already made a railtour appearance in Romsey, on 23rd July 2017. 68025 led 5Z54 15:01 Eastleigh - Romsey - Salisbury. 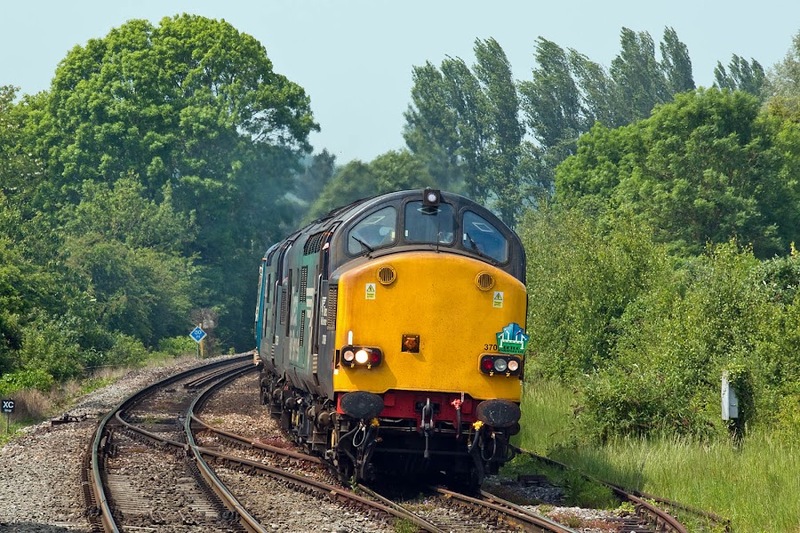 Since time was tight at Eastleigh, the run-arounds were cancelled, and the train was reversed at Laverstock Loop instead. 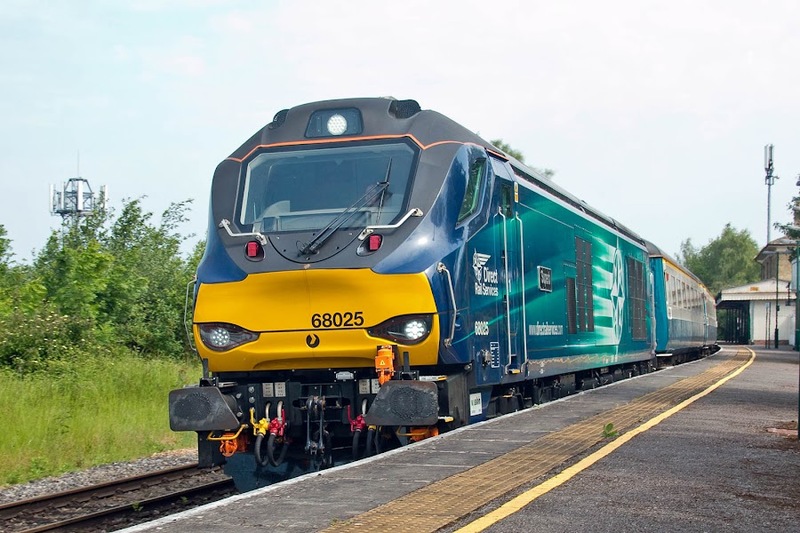 The Class 68 action today should only have been on this ECS segment, the reason for bringing it along was to run the air conditioning. The dim headlight is because the lights are pulsed - see the video below, where strobing is apparent. This is apparent to cameras, but not to the human eye. 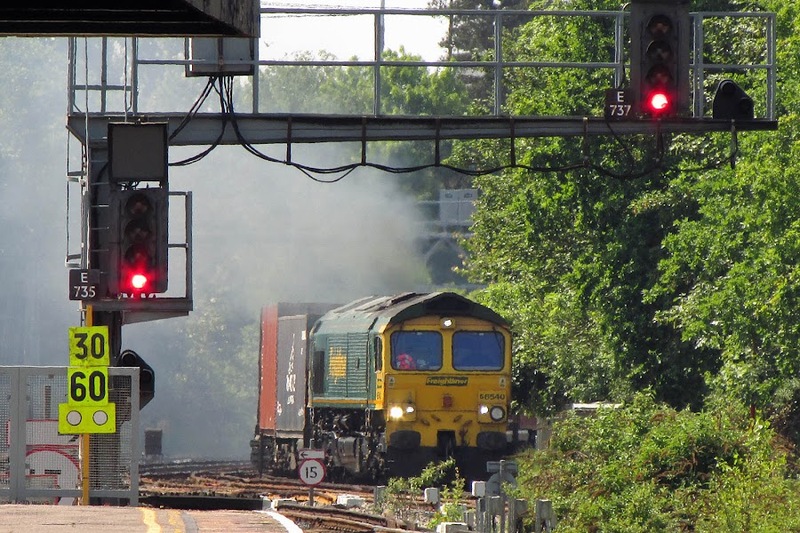 66540 Ruby lays it down thick over Southampton with late running 4M61 13:00 Maritime -Trafford Park, Tuesday 22nd May. 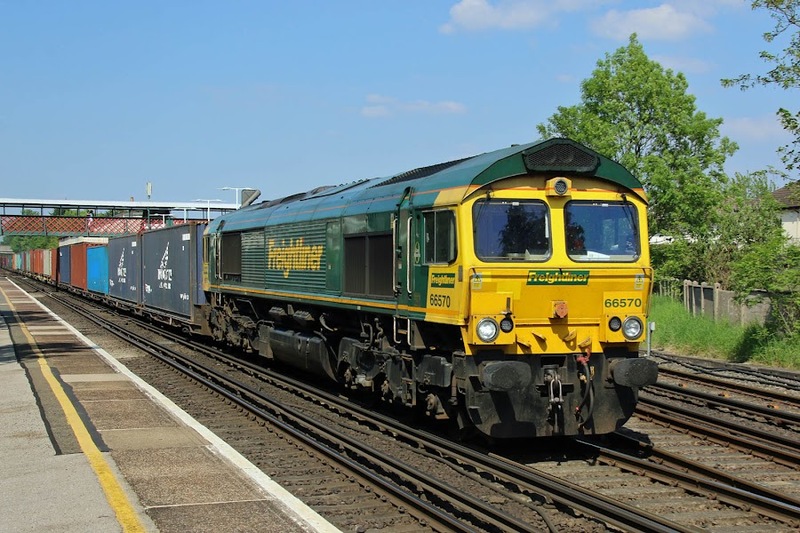 66221 stands in for a Class 59, 7V07 1241 Chichester - Merehead, passing Romsey 22nd May. 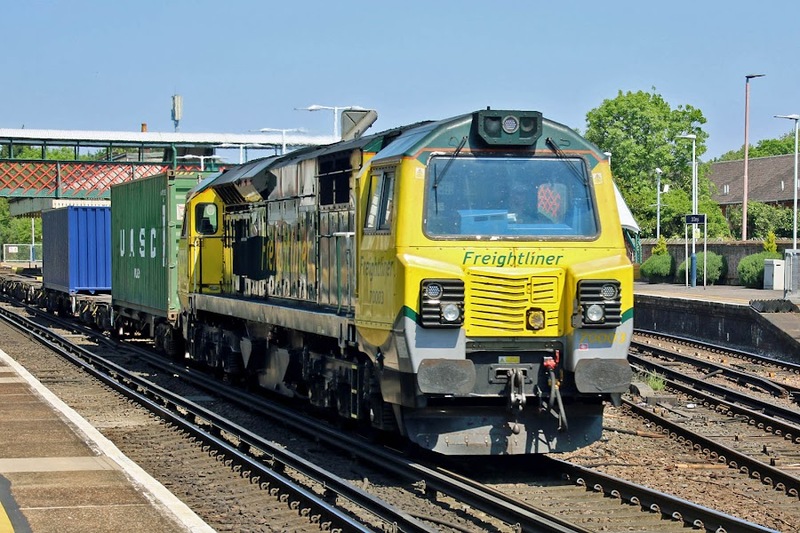 Freightliner have stored 70004 and 70010, leaving only 9 units in service. 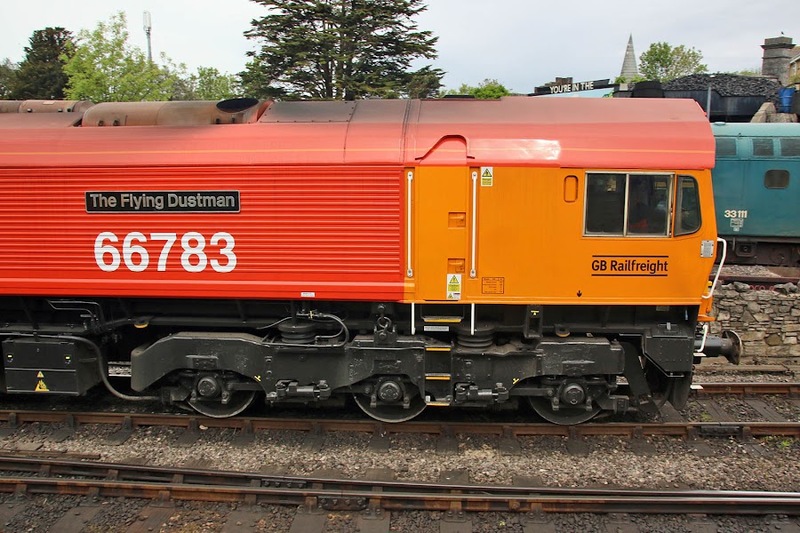 - 70010 was DIT to Leeds on Friday 18th, and was assigned this status on Thursday 17th following a tow south, and following a tow from Ipswich on Wednesday 16th. 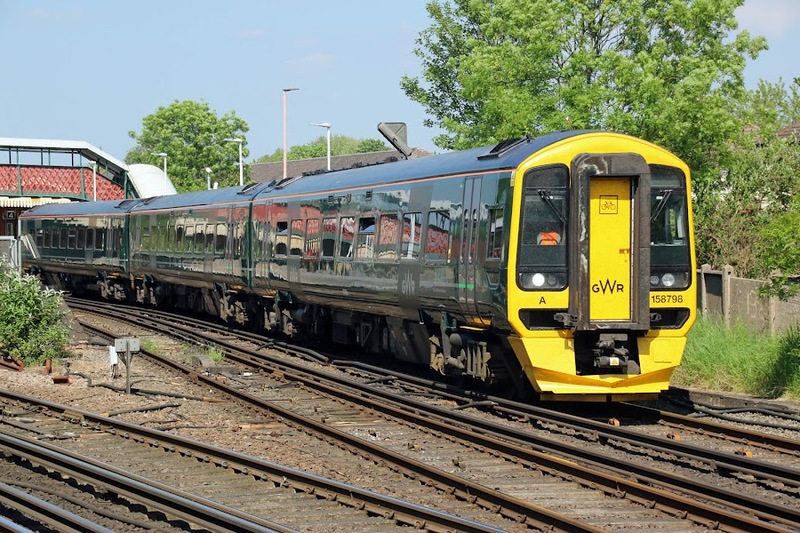 South Western Railway sees drop in passenger numbers - decline in season ticket sales, possibly since more trek to the office on less days per week. 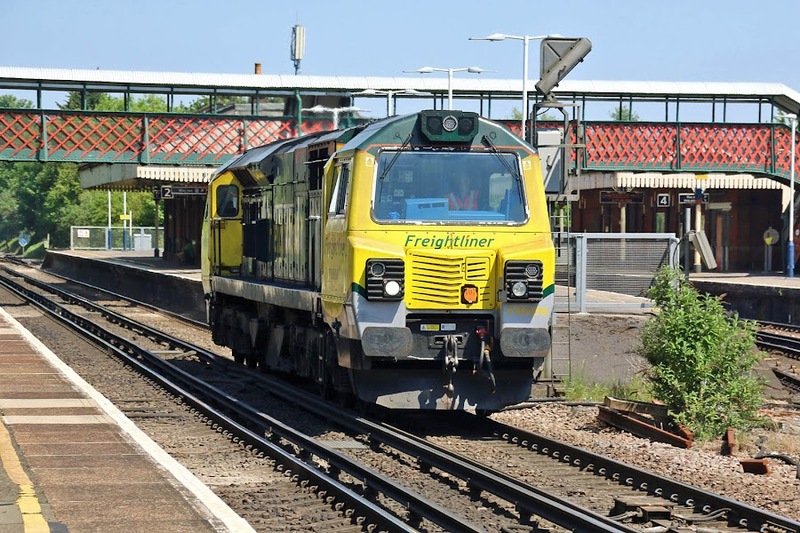 Freightliner appear to currently have 11 active Class 70 locomotives, now less than Colas have. 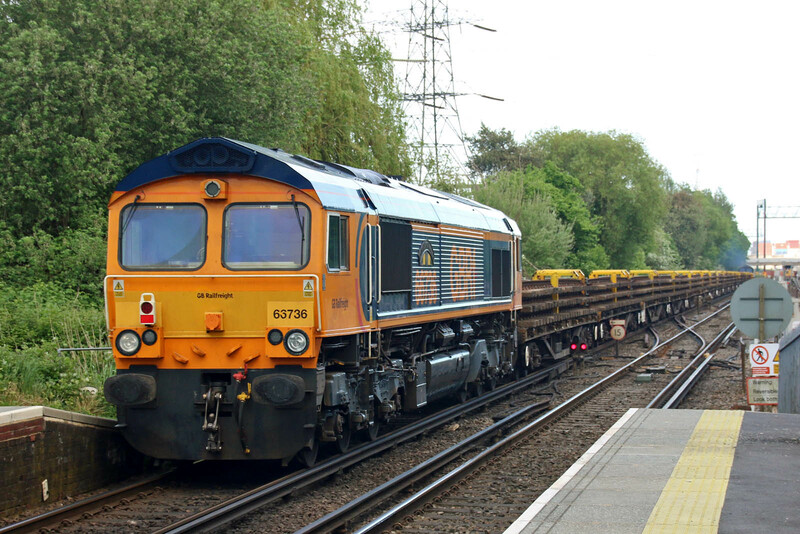 70006 returning from Eastleigh East Yard to Maritime, having deposited flats there for the weekend. 70003 4O27 05:21 Garston - Maritime. 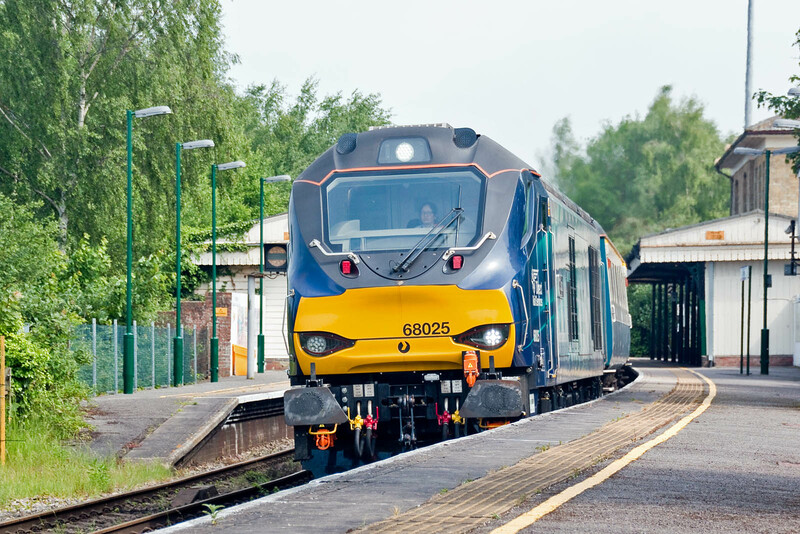 70014 4O90 05:27 Leeds - Maritime. 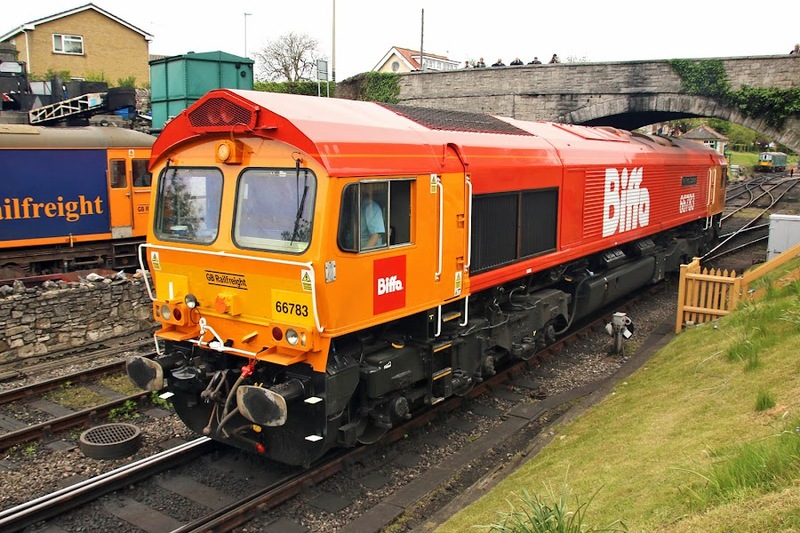 Additionally 70002 is understood to have been at Maritime. 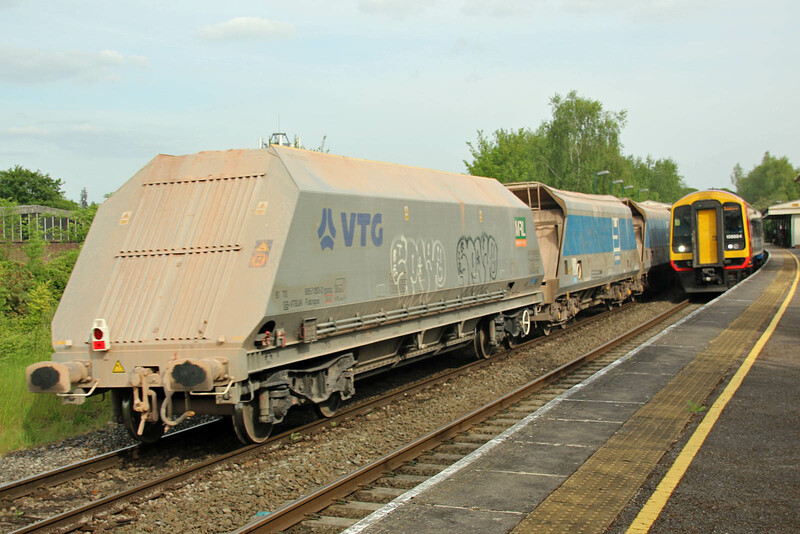 81.70.6957.093-2 (Astra Rail, Romania, 2016) was the HOA on the rear. 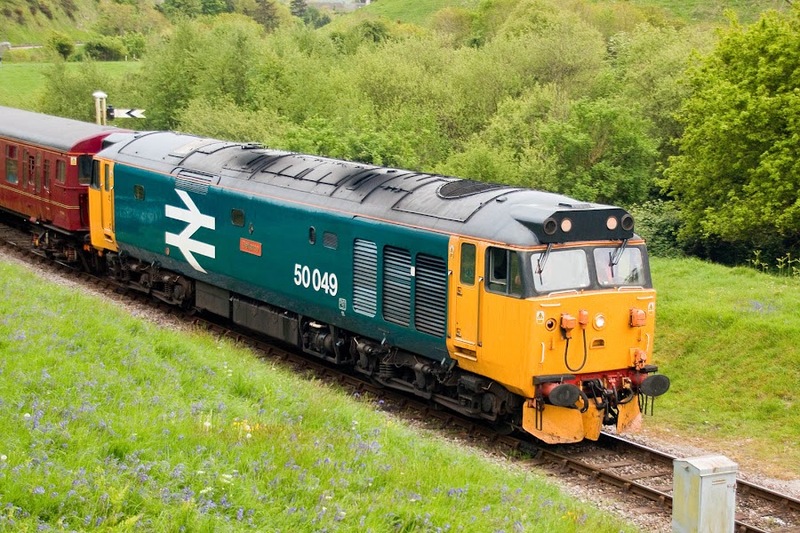 50049 Defiance was the last Class 50, completed at English Electric, Vulcan Foundry in November 1968. Withdrawn in August 1991, then purchased for preservation by The Class 50 Society in December 1991, later merging with The Fifty Fund - it has now spent more time in preservation than in BR usage. 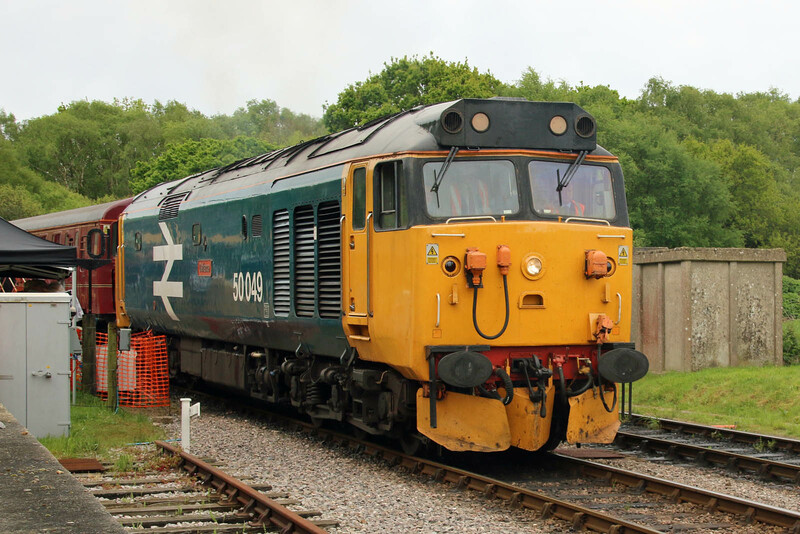 On Saturday 12th, 50049 was allocated to the Wareham shuttle working T+T with D6515 / 33012. 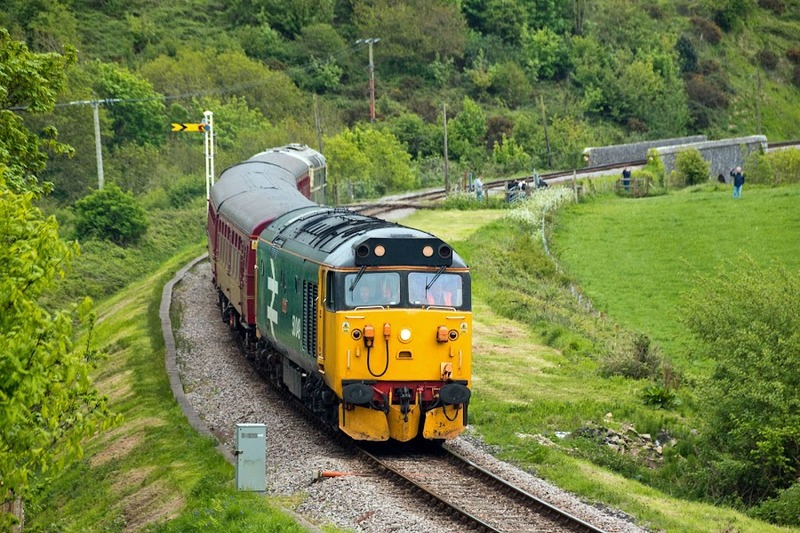 Running between Corfe Castle and Norden. Two pictures from the last run of the day from Corfe to Wareham. Returning Swanage convoy, Millbrook 14th May. Image by Ian Knight. 4442408 at Eastleigh Works, 16th May - moved later that day to Bournemouth. This blocked off a view of 47815 + 47812. 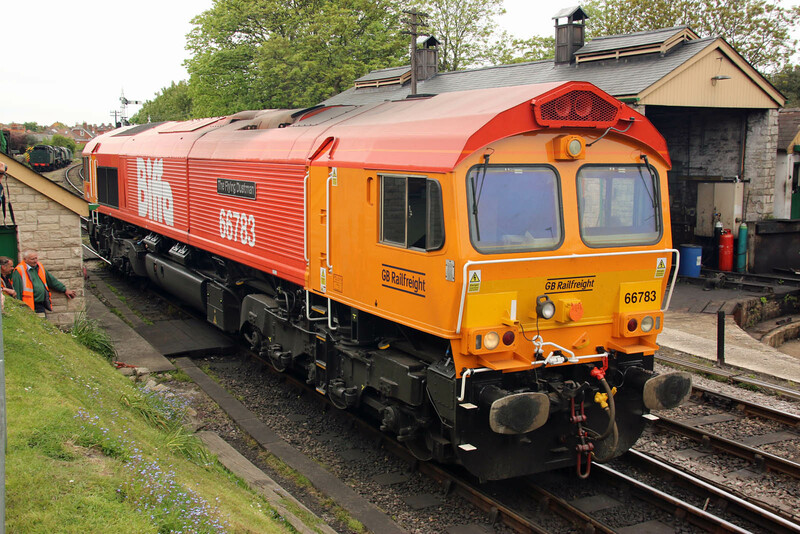 66849 Wylam Dilly 6O31 17:30 Westbury - Eastleigh. 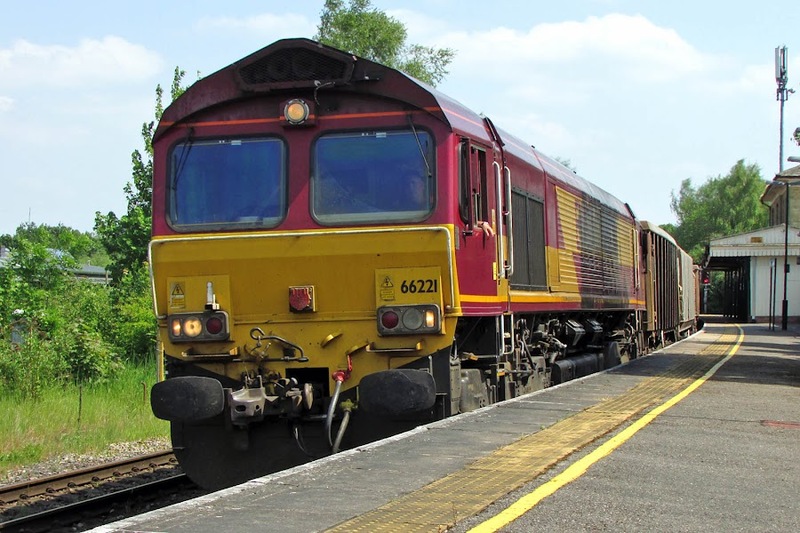 NLU 93465 is a JZA, a specialised development of a KFA bogie container flat into a Long Welded Rail Carrier and Tunnel Ventilation Wagon. 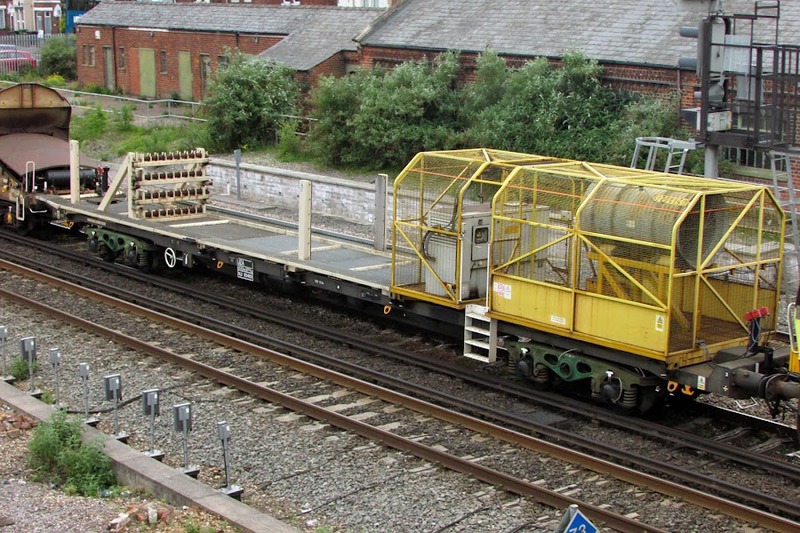 More on similar wagons. 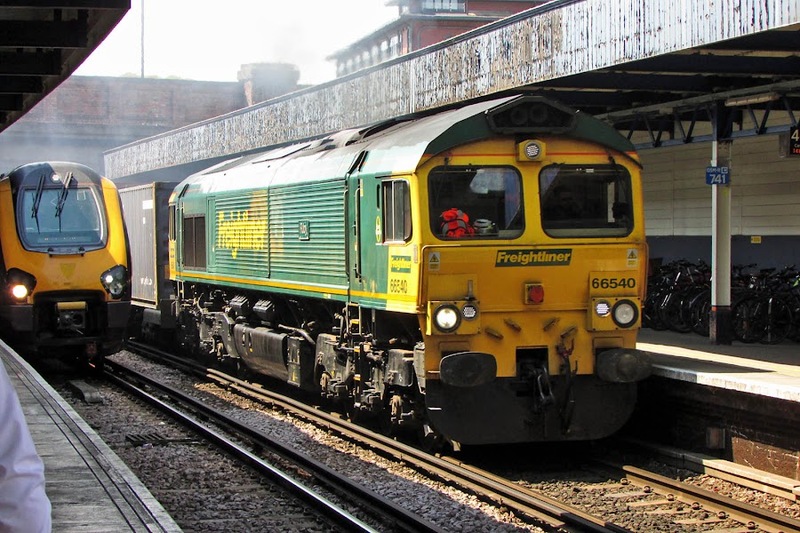 Freightliner have stored 70005 and 70017 - both seen here on 17th March. 70005 last worked about 19th April (seen on 18th), and 70017 on 16th April (at Leeds on 18th). 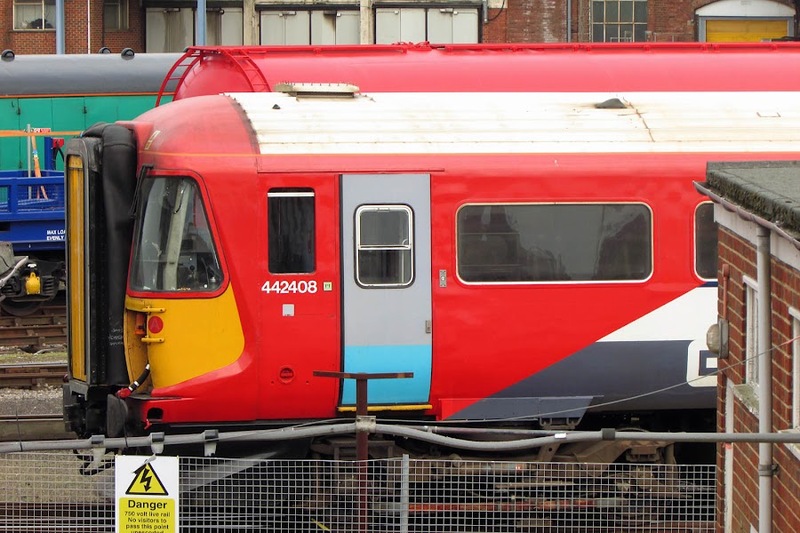 East Coast to become state managed and run as London & North Eastern Railway. 20007 was new as pilot scheme D8007, entering traffic at Devons Road (Bow) on 19th September 1957. After working on the LMR, ScR and ER, the locomotive was withdrawn in July 1993. 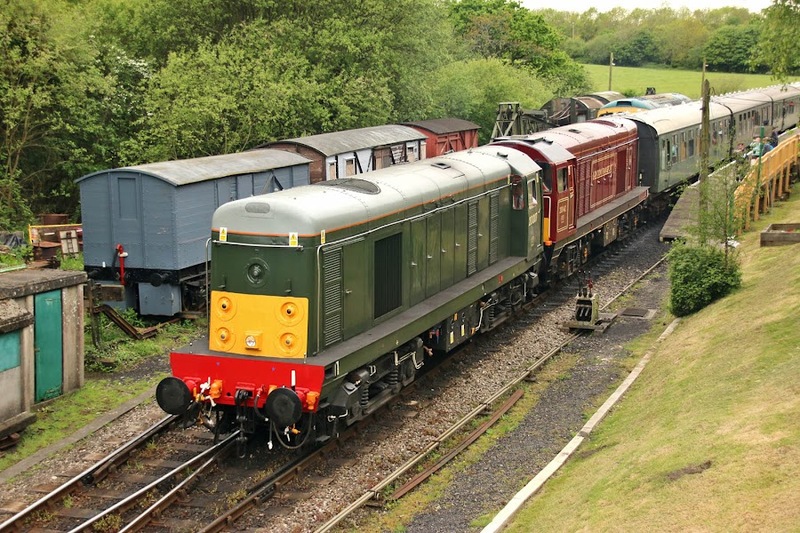 In preservation was kept at Cheddleton, then later at Butterley and Ruddington. Now based again at Butterley in the ownership of Michael Owen, and care of the Class 20 Locomotive Society, believed to be the oldest main line diesel locomotive working on Network Rail. 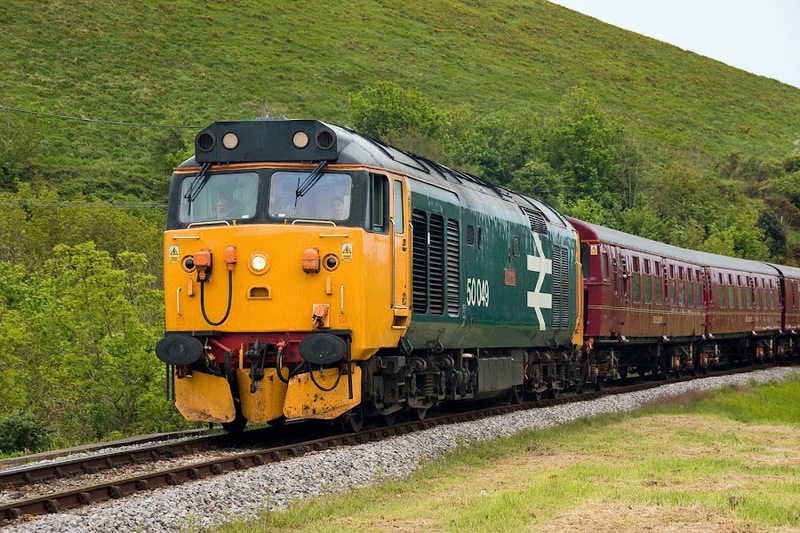 20142 SIR JOHN BETJEMAN is similarly in the ownership of Michael Owen and care of the Class 20 Locomotive Society. 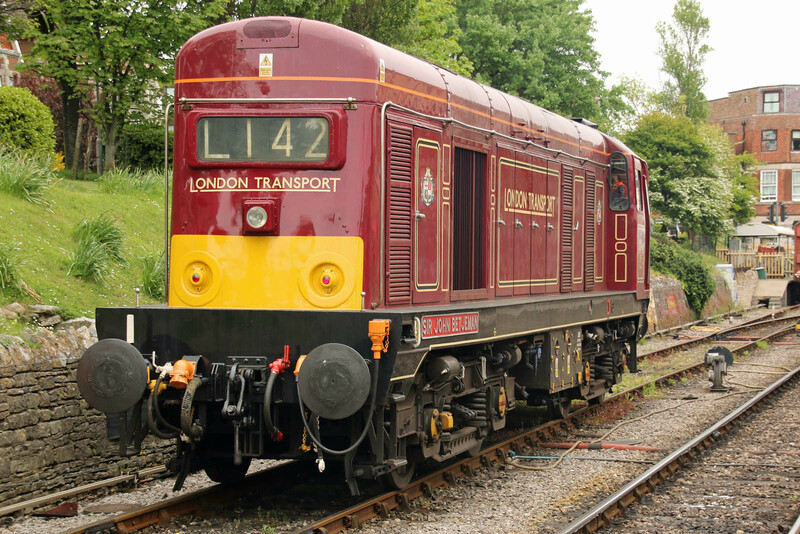 This locomotive was new on 21st May 1966, and withdrawn in July 1993. 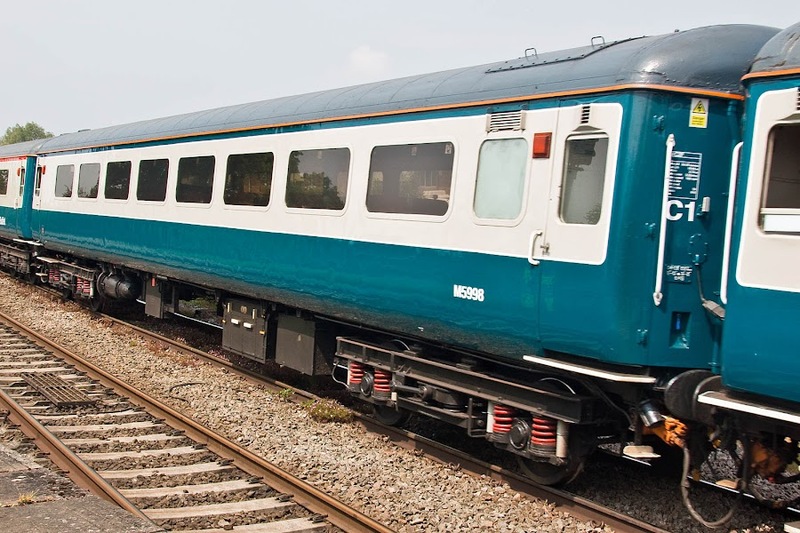 In preservation it has been kept at Llangollen, during which time it worked on Channel Tunnel Rail Link construction, then later at Butterley with main line access. 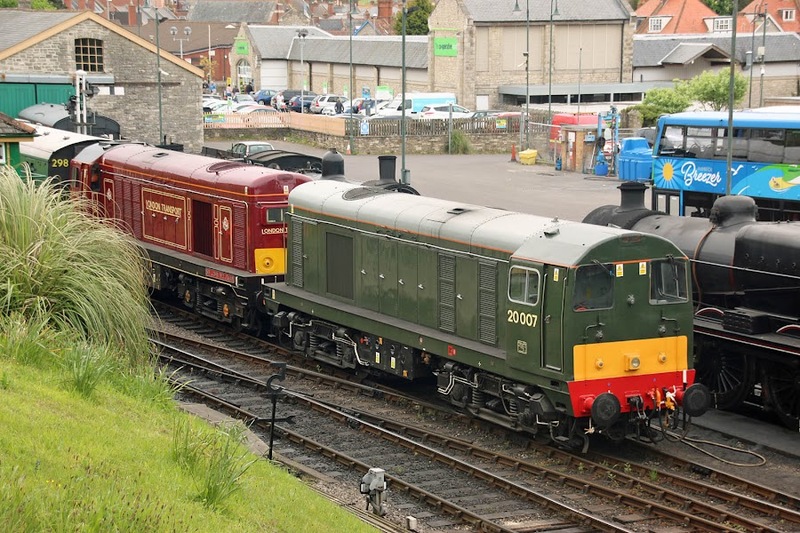 20007 + 20142 prepare for a departure from Swanage. 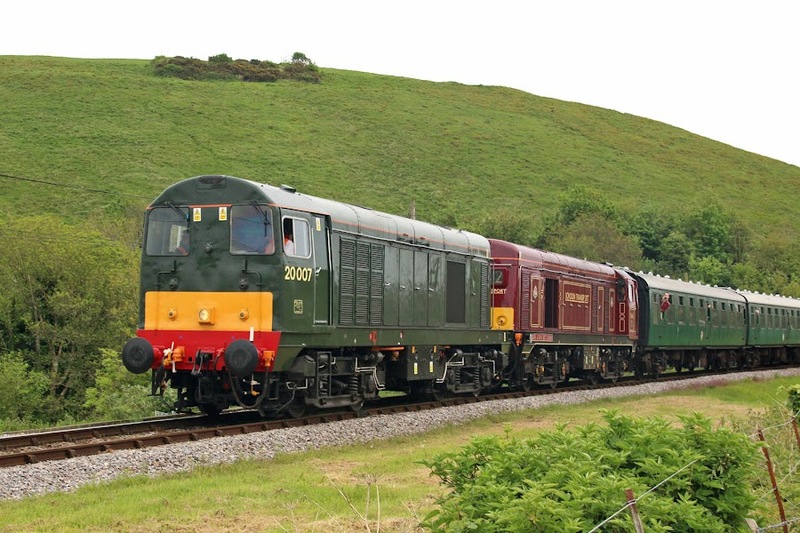 20007 + 20142 depart Swanage. 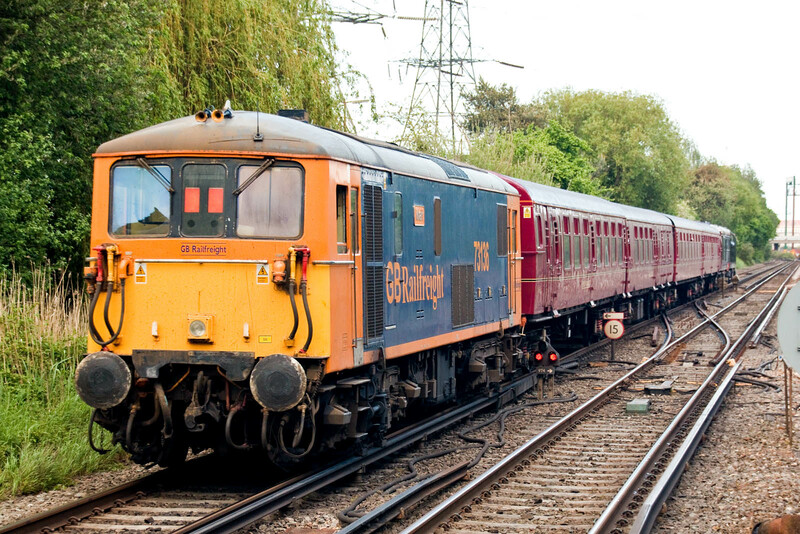 On 23rd February 1992, 20007 + 20032 + 33116 were involved in a "Solent & Wessex Wanderer" tour in this area one two. 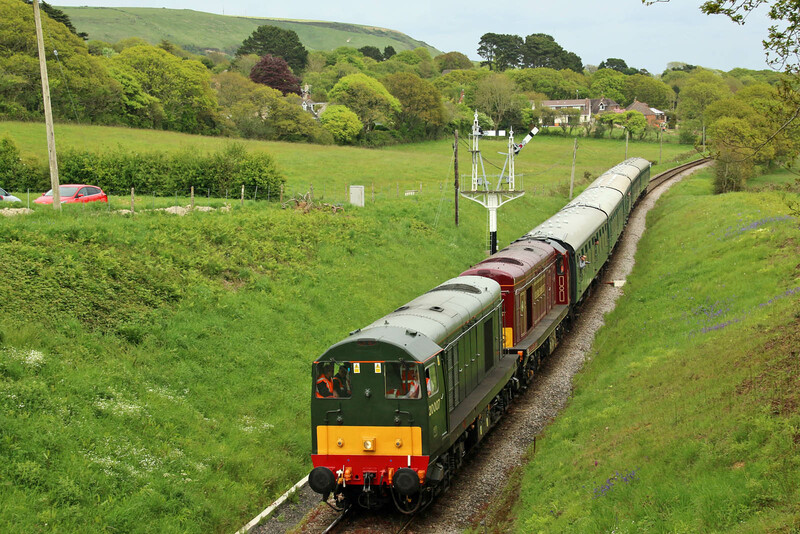 Returning nose first into Swanage. 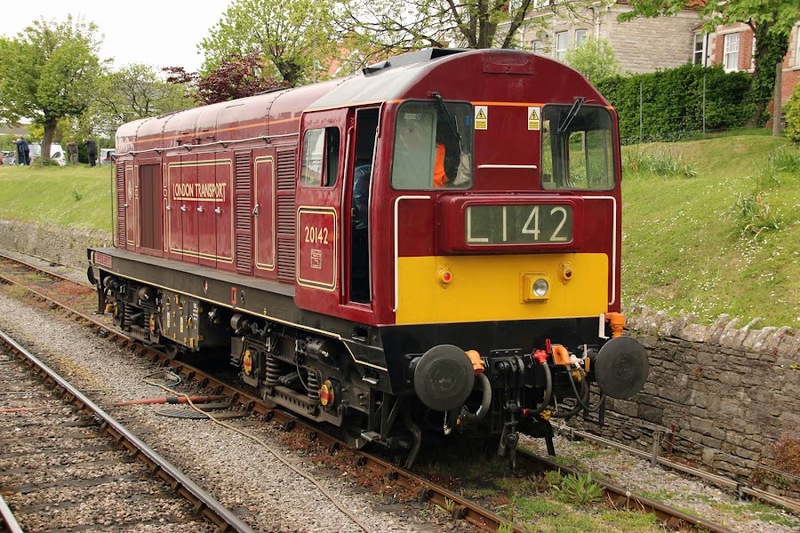 Details of 20142 between turns at Swanage. 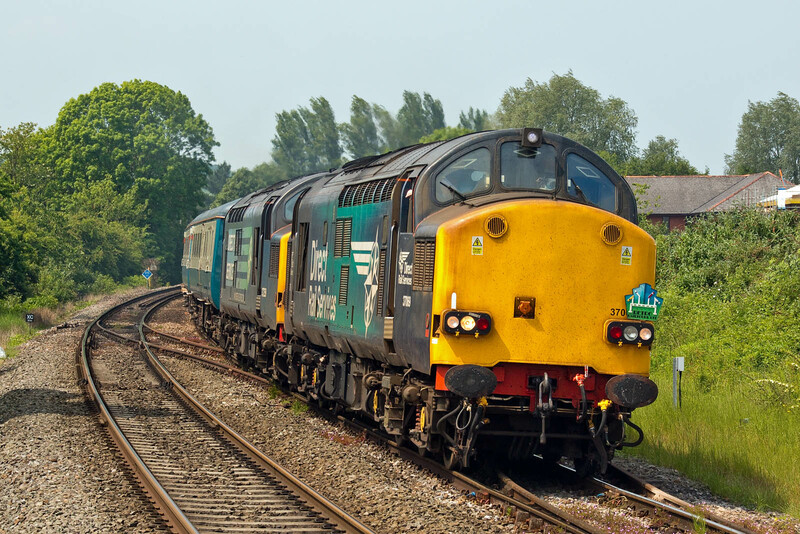 Another run around at Norden. 20007 and 20142 between Swanage and Norden. 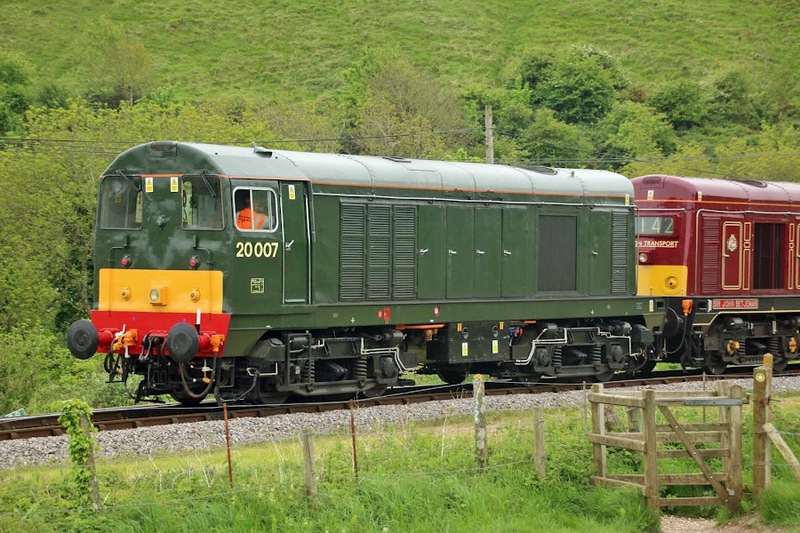 20007 is no longer mounted on pilot scheme bogies. 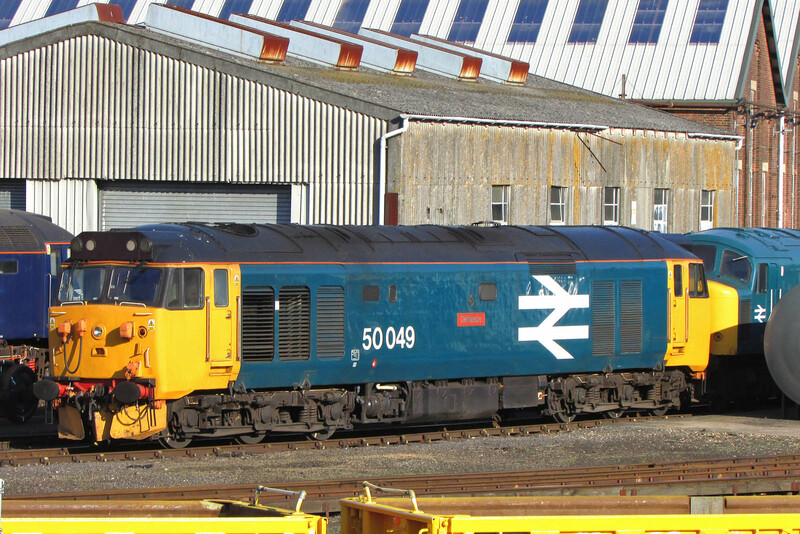 57003 50049 45041 50031 73133 at Eastleigh Works. A final view of 50049 in the evening sunshine. 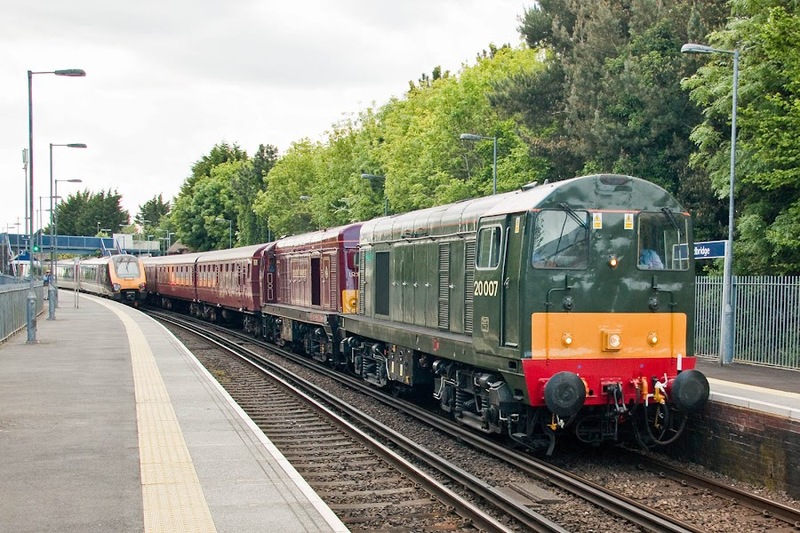 20007 + 20142 on 1Z50 15:25 Corfe Castle - Kensington Olympia. 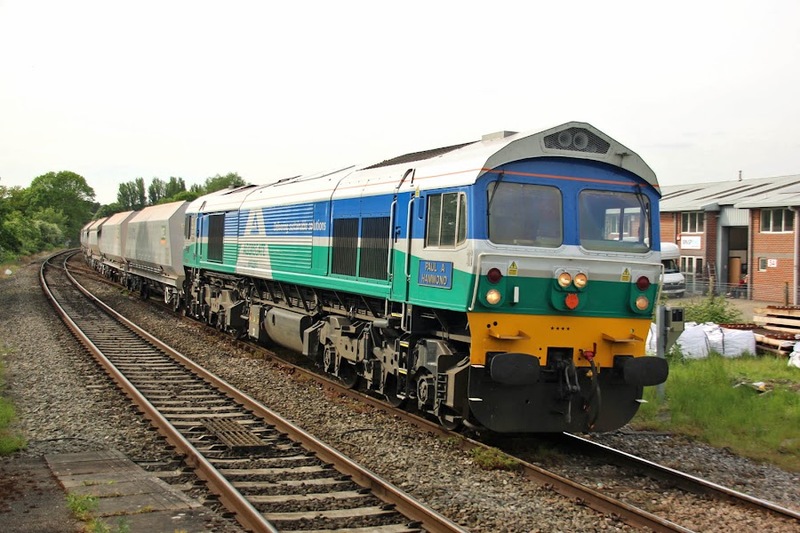 73136 Mhairi on the rear of the train, with 3rd rail shoes in contact with the rail. 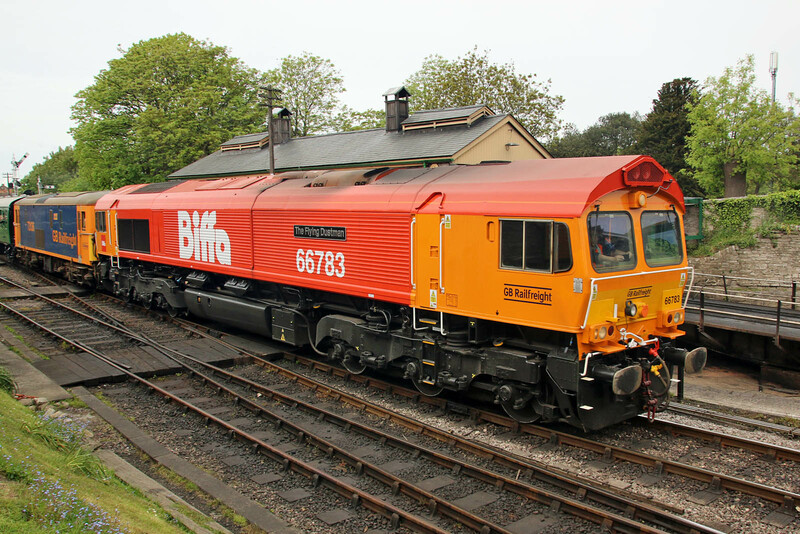 The locomotive was placed into "store" by GBRf while in Swanage. 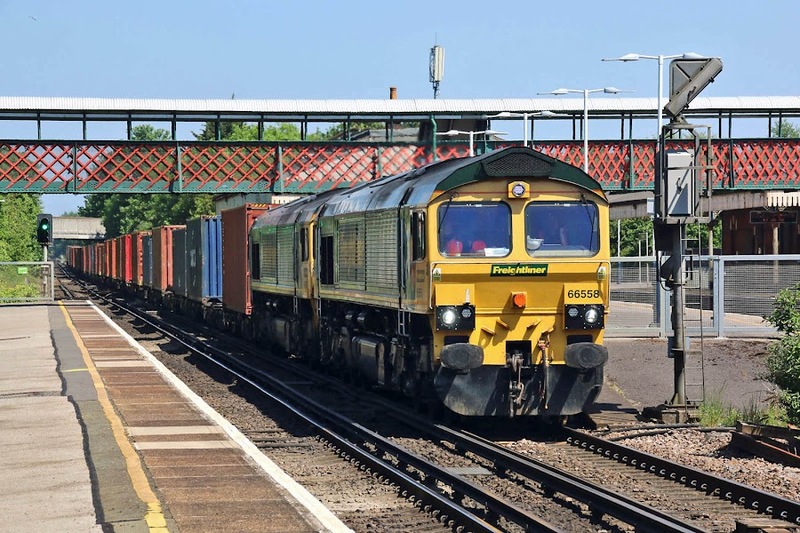 66846 6G13 14:30 Dorchester - Eastleigh. 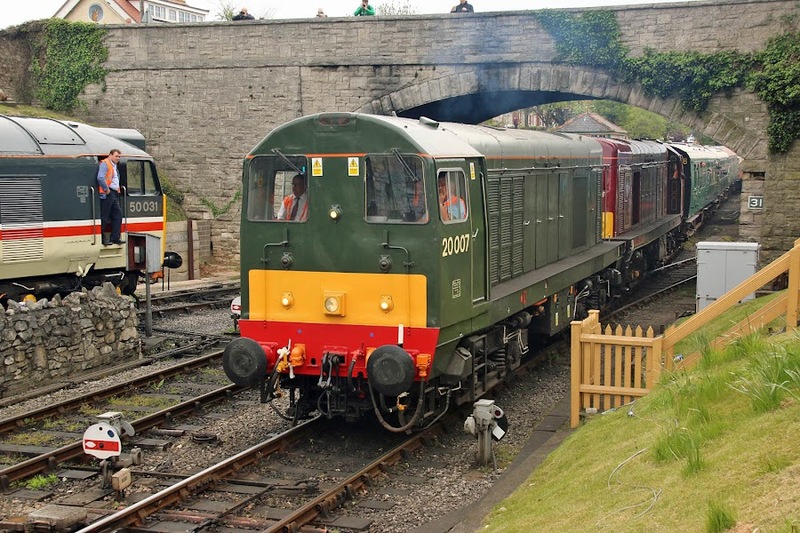 The Dorset engineering works became prolonged after equipment failure. 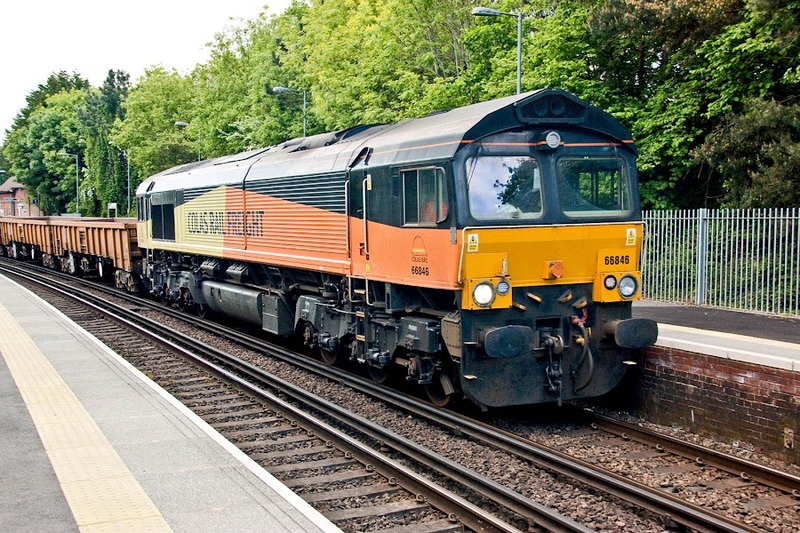 66789 British Rail 1948 - 1997 6G12 15:15 Dorchester - Eastleigh. 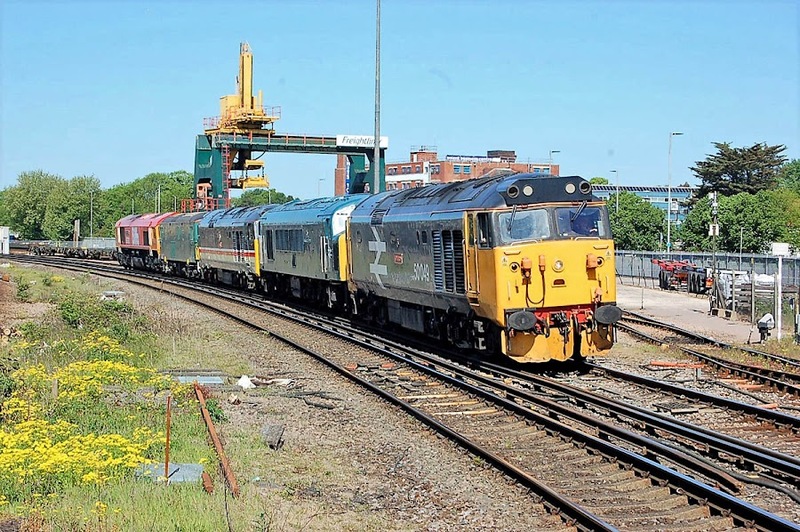 66736 Wolverhampton Wanderers on the rear.